Being one of the reputed organizations in the market, we are engaged in providing an exclusive range of Men's Casual Shoes(Beige color). 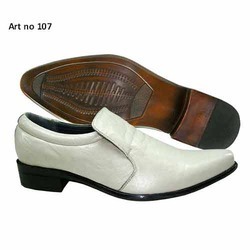 Our Brush Off Leather Comfort Shoes are available in varied colors and designs. While the formal designs match well with corporate attire, without compromising on comfort, these are easy to maintain and retain their finish and shine for longer time periods. Made of superfine quality leather, they are durable and last longer.